I'm rather excited about this recipe. There are quite a few of us doing the 5:2 diet at my work, so conversation at work often revolves around our diet and what we are eating. I tell you we must be saints to have a break in our staff room. One of our workmates Shirley piles the table high with goodies and we have to try and resist on our fast days. Mind you she may think twice now she is also doing the 5:2 diet herself, although I wouldn't bet on it. Anyway I digress, Karen was the one who told me about this fabulous idea. You simply whizz up cauliflower and then gently cook it, season it and use it in the place of rice. Of course I used my Vitamix to whizz up my cauliflower in 3 batches but if you have a standard blender or food processor, then just do a little at a time. 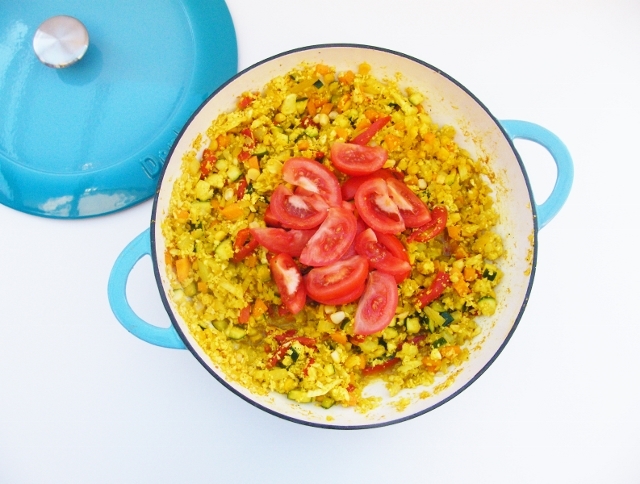 Spicy cauliflower rice with onion, courgette, carrot, red peppers, sweetcorn and ripe salad tomatoes. A huge bowlful for only 137 calories. The peppers in this dish were from Cooks and Co and I don't remember having such nice jarred red peppers before. Lovely big peppers that were succulent and sweet and I was surprised at how low in calories they were. Two large peppers for only 23 calories. I will be using these in a salad soon or maybe just on toast, since they are so good. 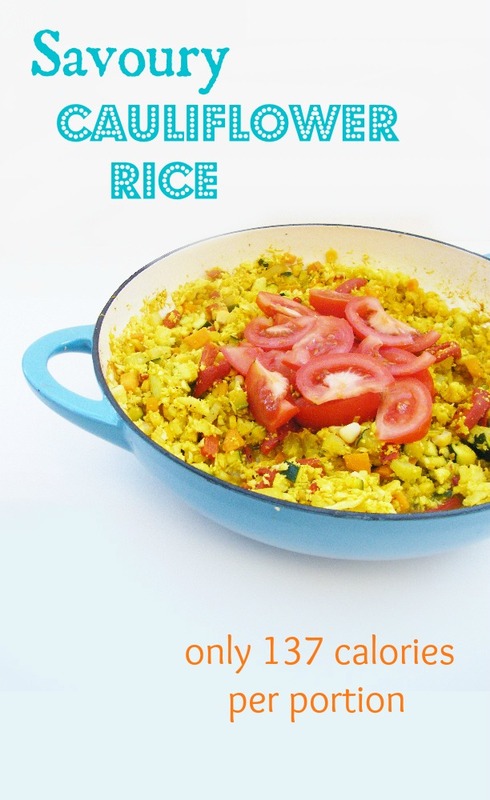 A super low calorie meal that is satisfying and packed with flavour, Only 137 calories per serving. Have you tried the 5:2 fast diet yet? I am submitting my rice dish to Credit Crunch Munch, a monthly challenge set by Helen over at Fuss Free Flavours and Camilla over at Fab Food 4 All. My rice dish was very frugal. I made it from what I already had in my kitchen. The peppers were free and I used up my last carrot and courgette. Disclosure: I received a vitamix and the peppers free for review purposes. I was not required to write a positive review and any opinions expressed are my own. This sounds great - will def be trying this! Good, hope you enjoy it Katie. It would be good with some chunky pieces of cucumber on top as a contrast. Thanks. I will be trying it for lunch. A big improvement on the crispbreads I usually have, so I will have lots of calories left for my evening meal. Me too, I usually make cauliflower cheese or soup with it. Just from looking at this, it's hard to tell it's not rice WITH cauliflower, but rice FROM cauliflower. I cannot WAIT until I can splash out for a Vitamix (must wait 'til after taxes) but I'll certainly be trying this! It is inspired Tanita. Wish it was my idea. You are so going to love your Vitamix once you get it. I've heard about it before but never tried doing it. There's also Cauliflower pizza base which you make with the 'rice' and some kind of stringy cheese (e.g. mozzerella) I keep meaning to try because I've seen a few recipes and they all look fabulous! Wow, that sounds rather amazing Fiona. I can't believe I am the last to hear about this. That's ok. There is just so much it can be used for. That looks and sounds delicious- such an underused veg too! Certainly doesn't look like diet food, unreal how low in calories it is. Look forward to trying this out, don't have many cauli recipes. Usually just add to a curry/fritter type thing/crudite, raw. I don't use cauliflower enough myself, but this will certainly perk up my fast lunches. I'm going to have to google the pizza base & see for myself, although I do sometimes have half a thin normal pizza with not much cheese on it on fast days. Great! Let me know what you end up making with the rice Tandy. What a great idea. It's amazing just how much food you can actually eat for few calories if you're creative! My hubby and I have been doing the 5:2 diet for 4 weeks now (Mon & Tues) back to back and it's amazing. 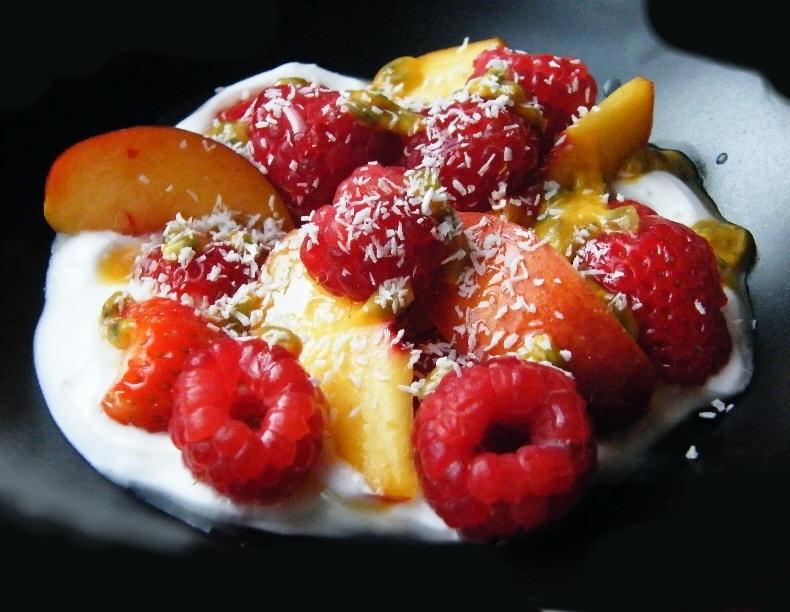 It's much easier when there are lovely recipes like this to keep us on track. That's a super recipe, Jacqueline! Love the idea and your presentation is so colorful and healthy looking. The name can be misleading Barbara, it is more about restricting your calories twice a week, not so hard when you can eat what you like (within reason) on the other five days. Everyone is talking about it here in the UK. It wouldn't be such a beautiful colour without it. Turmeric is so handy to have in the kitchen. I think this looks great! How interesting to use cauliflower like that. I am definitely going to try it. This cauliflower idea is pure genius and your meal looks nutritious and delicious for any meal - fast day or not. I sit right next to the biscuit / cake corner at work and it's funny how everyone brings in particularly yummy things to eat when I'm on a fast day. It's sods law isn't it Choclette, although I find it easy to resist during the day, it's late at night that it is harder. Good idea Janet, I will have to try the zucchini noodles on one of my fast days. 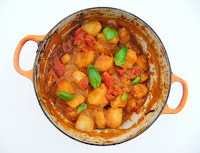 Lovely recipe and photos Jac, this has been on my to list for some time. I do like your 5:2 approach of a large bowl of food, rather than smaller portions of normal food. I think massive bowlfuls of veggies is the only way to go, I need my tum to be full. Hey Helen, I have since found that there is way too much in a quarter of this casserole full for one, I think there are actually 6 portions, so even less calories.I look forward to seeing what you do with it. Thanks Metz, someone mentioned it to me, but I hadn't seen it. Just printed this out to try as have recently started the 5:2 diet too. Can't believe how low the calories are and it looks yummy! I think this a great little recipe - full of flavour and enough to fill you up. Fantastic that it is so low in calories! I didn't mind the texture at all, maybe yours needed cooked a little longer. It's definitely not as good as the Moroccan style potato bake, but there isn't much that can beat that dish. This is great for being so low calories. I can eat a bowl of this instead of two crispbreads with a triangle of soft cheese for the same calories. So this wins that race. I cooked this for dinner last night and I thought it was fantastic! I am not on a diet so I topped it with a fried egg which worked brilliantly. 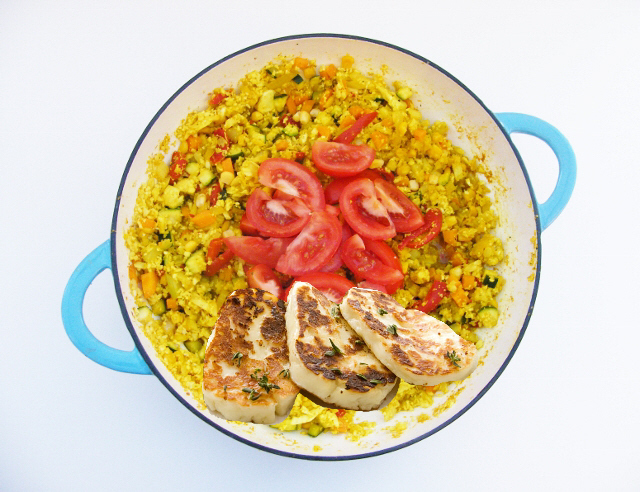 I am in love with cauliflower rice, its great and I love the spices in yours. Great stuff so thanks! Wow, this looks yummy. I'm on a fast day today and have 300 calories left for tea - and a cauliflower in the fridge - sold! Hi because your recipes are for more than one serving, can you append whether you tried freezing it? SOme food works well with freezing, some less. How about this califlouwer rice? Thanks! I did freeze it and it was fine afterwards. Such a great way to start my 5:2 diet - thank you so much. 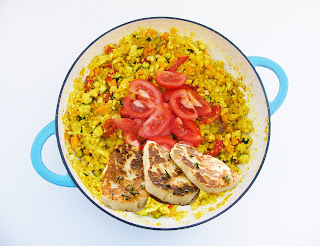 I never would have thought of this use of cauliflower and the veg and spices work perfectly with it. Thank you so much for this recipe. Much appreciated! Is it 137 or 127 calories? The main recipe says 137, but the variations bit says 127. Can you use the standard vitamix jug to whizz the cauliflower or do you need to use the special dry container jug? High sorry I missed this, I can't remember which I used. I have an Optimum9400 now and it does wet and dry so I don't have to change. Wow - I'm a veggie also on the 5:2 diet and SO excited to find your 5:2 posts. Lots of ideas to try - thank you!! Yay! Enjoy the recipes Kate. 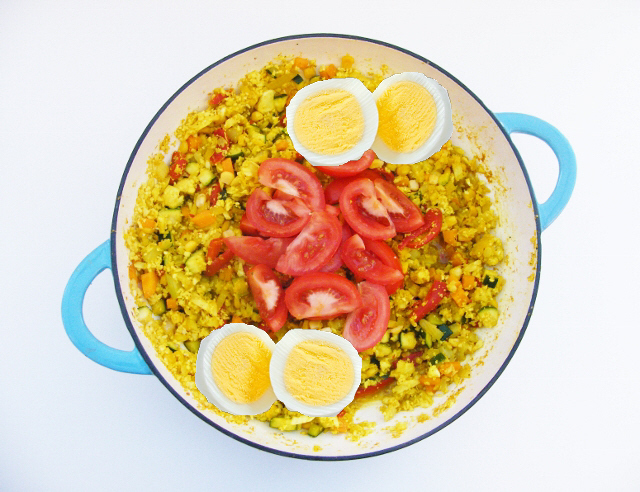 Do try my moroccan potato bake. It is amazing! Great recipe, I've been looking for this it's so quick and easy to follow and ideal for people who are not keen on Rice. I'm going to share on my facebook page on Tuesday!